I decided that I should do my own IBM Model M mod. 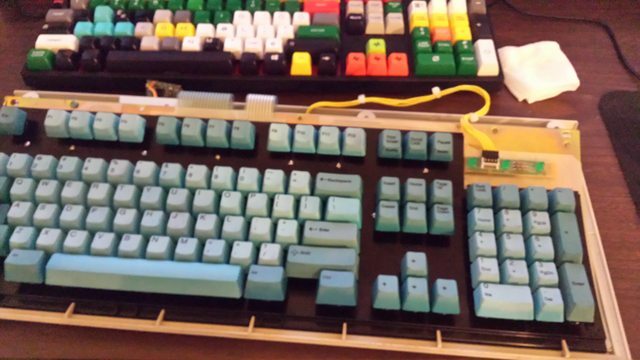 In early March of 2015, I bought a Model M from a Geekhack user on the cheap. The keyboard was bolt modded, had a wonky membrane, and no cable. I did a few mods to it. I dyed the caps aqua colored utilizing Jacquard iDye. I boiled water and used an old metal colander to submerge the caps. I oriented the caps in the same direction in the bath, and that gave them a nice gradient. 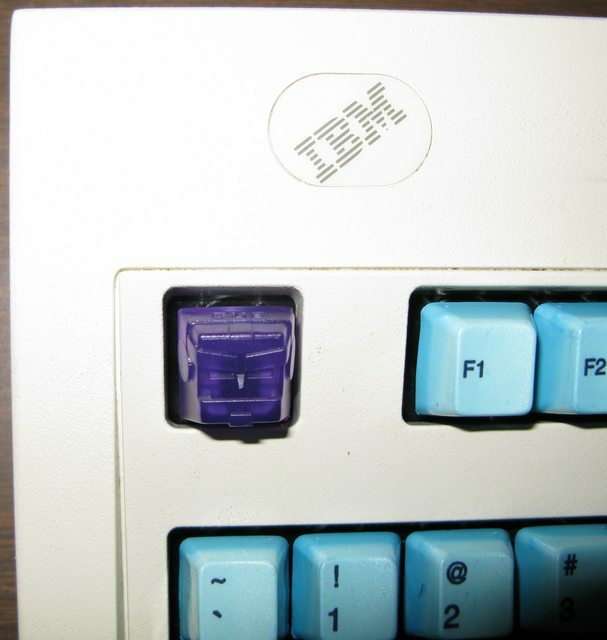 Since few new computers come with AT-DIN connectors any more, for this IBM Model M Mod, I wanted to add a USB. The original connector of this board was a hard-wired DIN connection. 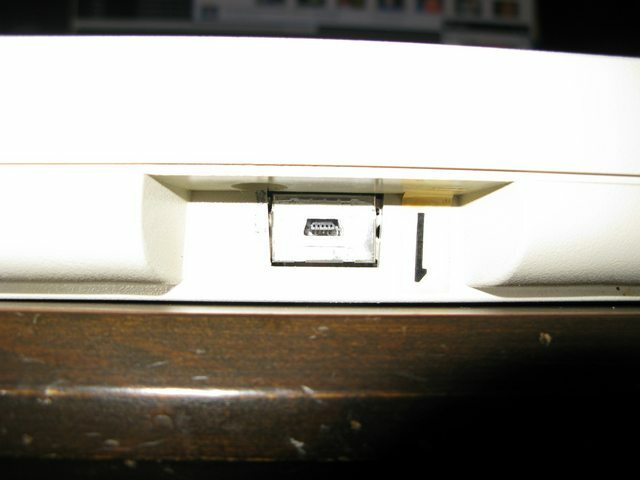 I removed the old connector and added a Teensy for USB capabilities. Desoldering the wires was easy enough, but I actually went through a few Teensys in the process. I had a Teensy 2.0, but while soldering it I damaged one of the resistors/capacitors and the socket. I did some work on it with the Teensy 2.0+, but I am going to use that for another project. I bought a Teensy LC, but the ARM processor was giving me problems. So I finally went with another 2.0. I’m pretty proud of the usb connector. I took the old DIN socket and ripped it all to hell with my Dremel. I made little slots so the teensy board would slide in and super glued it to that spot. I filled in the open area with epoxy clay so it looks fairly clean. I also desoldered all of the old ugly green LEDS and resistors on the breakout board. I put in their place some bright blue LEDs and appropriate resistors for them. Now everything looks bright and color coordinated. I have a BS compatible Brobot from [Ctrl]Alt as the escape key. This picture is nice because it really shows off the color gradient on the other caps. 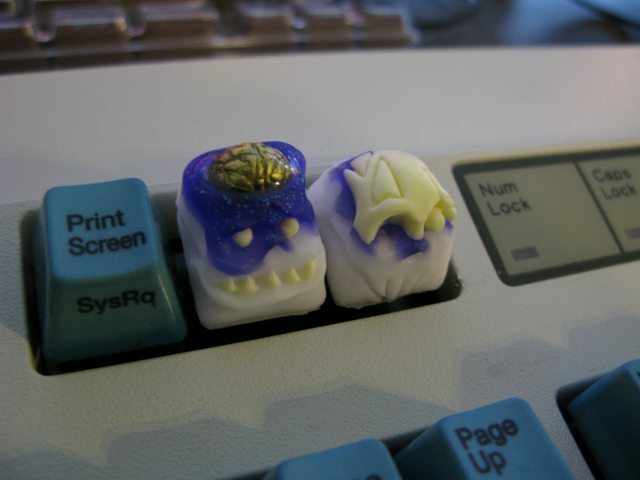 I also have a pair of glorious multi-shot Krap bonus caps on the pause and scroll lock buttons. 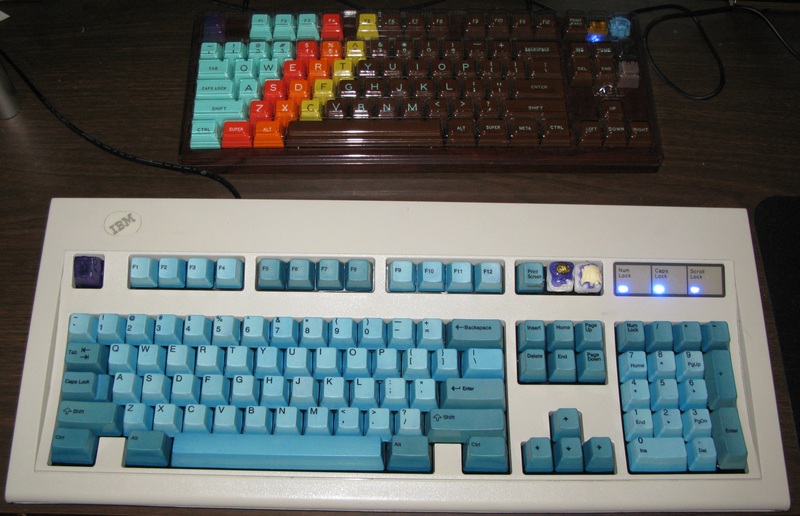 Now I have a very attractive IBM Model M Mod.